This is the 2nd zombie film I have seen from New Zealand (the first being the gore fest Brain Dead). 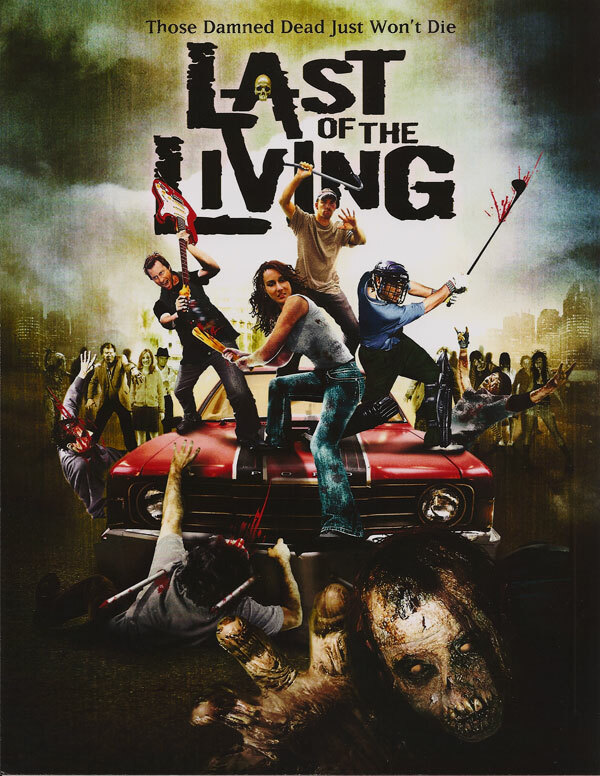 Last of the Living is another zombie comedy, but has less in common with Brain Dead, and more in common with the likes of Shaun of the Dead, and Zombieland albeit on a much lower budget. Last of the Living takes place 6 months after a zombie apocalypse has swept the globe. 3 losers Morgan, Ash, and Johnny while away the days drinking, watching films, and playing video games. To them the apocalypse was the ultimate adventure, and they are happy, if a bit bored in their lazy lifestyle they have chosen. They don't see the undead as a threat, and the only real negative thing they seem to have about current events is the lack of females. While out driving in Johnny's modified Cadillac they come across a female survivor. She is a Scientist who has the potential cure to the apocalypse, and a plan to implement it. Deciding to make a difference to the world (and to possibly pull the attractive girl) they decide to team up with her on her mission. The film is really really funny, but also manages to be downbeat, and depressing. The 3 lads comprise of a geek (who always wears armour when going outside which gets him heckles from his mates for being a wimp), a self obsessed jerk who is convinced he is Gods gift to women (he phones up random girls he used to know on the off chance they are still alive and may want to hook up), and a crazy man (his biggest wish is to perfect his 'special move' he created when boxing, as well as get his Rock bands demo tape heard despite him being the only surviving member). The characters play off each other fantastically, constantly insulting each other, but genuinely do care about each other. The female character in comparison is much more subdued and bland only seeing the bad side of the apocalypse, and driven on her mission. There are a few other characters, but for the most part it is just these 4 the film revolves around. The contrast between the lads and the girl is brilliantly done. Hearing the boys describe their Towns last stand against the zombie hordes is hilarious. They didn't actually participate in the last stand but described the 6 day long stand off as 'sounding awesome' from their vantage point at a house hanging out. The girl just can't understand how such lazy people could survive. The undead are not taken seriously by the boys. They see fighting zombies as a game, and get great pleasure in battling the zombies, and ogling the female zombies. The film concerning the death of the world is downbeat at times, which the excellent soundtrack compliments, you come to care about the likable characters, and really want them to win. A few niggly problems with the film. I really don't know if there would still be power 6 months after the apocalypse. Phones, household appliances all operate fine, and shops still have full power (lit up, music playing over the intercom, electronic doors working). It would be cool if power did last that long after the apocalypse! Characters also don't really seem to value life. When people die they are sad up until the next scene when the dead characters are pretty much discarded and never mentioned again. The zombie effects are not brilliant, mostly just face make up to show the zombies, but there is variety, everything from chained criminal zombies, to bride and groom zombies to workmen zombies, and it is funny when characters reckon zombies as ex girlfriends, friends etc. The zombies also have a disparity in how they act. Early on in the film the zombies are the slow, dim witted shuffling kind, while later on the zombies are more the 'rage' style zombies being able to run super fast. I think the reason the characters are so careless about death is that they know they cannot survive and are just making the most of the time they have left happy in the knowledge they have survived longer than friends and family. I really enjoyed this film, it has a likable cast, and made me not only laugh out loud in places, but also really worry for the characters as well. 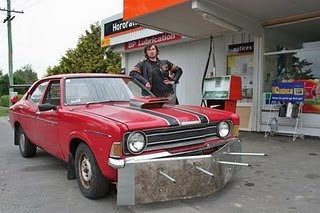 A very good film, New Zealand's (low budget) answer to Shaun of the Dead!